The blades give a 70 cm width of cut and are diamond ground for precision cutting. They have a 34 mm tooth gap which means you should be able to cut through twigs and small branches of up to 34 mm – that’s just over an inch in diameter without any problems. The machine is sold as being suitable for both high and medium height hedges and shrubs. 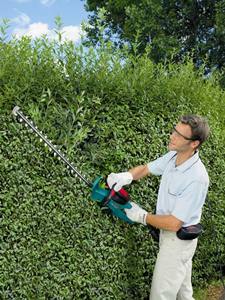 The blade length ensures that wide hedges are no problem either. The cutting performance is superb with the Bosch AHS 7000 Pro T Hedgecutter – as mentioned the blades are excellent, laser cut, diamond ground and of extremely hard steel, the blade tip protector gives added reassurance if your hedges and shrubs are close to your house wall or a fence or when cutting close to the ground. A useful and inexpensive addition to your purchase of this hedge cutter, would be the Bosch AHS 7000 Collecto 70 which is a neat little attachment that fits to the blade, enabling you to direct or ‘sweep’ the cuttings as you trim your hedge. Very useful if you want to direct your clippings down into a bag or onto a collecting sheet and helps avoid clippings falling into the neighbour’s garden! The machine is designed to be really well balanced with an optimum centre of gravity which will definitely save your aching shoulders and the advanced handle ergonomics with four switch positions make it a joy to use. The motor is very high performance with a high-torque slipping clutch that makes for easy cutting and a push rod drive that makes the machine very popular with the neighbours, because of it’s quiet running! As mentioned, the Bosch AHS 7000 Pro T Hedgecutter comes with a manufacturer’s two year warranty, you also get a protective blade cover for storage and carriage and a a good length of cable, (12 metres supplied). 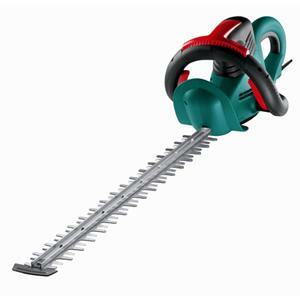 This entry was posted in Product Reviews and tagged Bosch AHS 7000, Bosch AHS 7000 Pro T Hedgecutter review, bosch ahs 7000 pro-t hedge cutter, bosch ahs7000 pro-t hedge trimmer, Bosch Hedge Trimmer review. Bookmark the permalink.